Cataract Surgery | John Frangie, M.D. 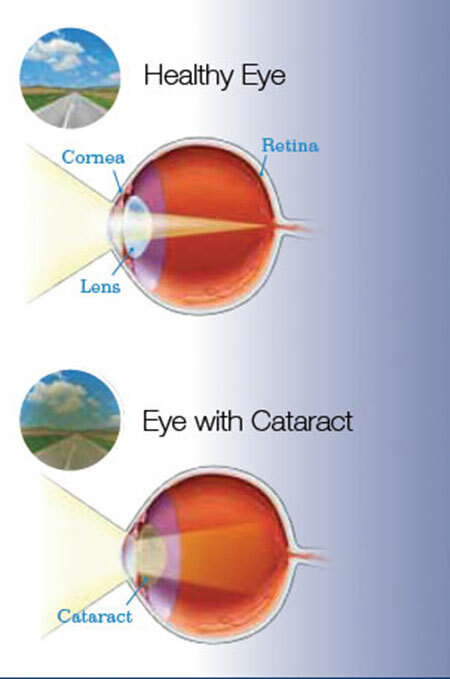 Contrary to popular belief, a cataract is not a type of “film” that forms over the surface of the eye. In reality, a cataract is a change in the clarity of the lens inside your eye, a gradual clouding that can make your vision less sharp over time. You see, the eye works much like a camera, and like a camera, depends on a clear lens to properly focus images. A healthy, transparent lens absorbs light and accurately focuses it onto the retina (the back of your eye), providing a crisp, clear image. Although the majority of cataracts develop on their own, as part of the natural aging process, there are certain risk factors that can contribute to cataracts developing earlier, or at an accelerated rate. How common is this surgery? Cataract surgery is the most common surgical procedure performed on adults in the United States. We are a Bausch and Lomb Center for Excellence in West Springfield, and as such we have an expert staff on hand to help with the procedure. The eye surgery is performed on an outpatient basis, generally it takes a half-hour or less, and recovery time is usually only a few days. Modern-era cataract surgery is considered a “day-stay” procedure. Most ambulatory surgicenters and hospitals will allow the patient to remain in their own clothes, with the addition of a gown, cap, and shoe covers in the operation room. Patients can expect the trip to the surgicenter to last for about three hours. The procedure is usually performed under topical anesthesia and dilating drops. Additionally, an IV is placed to facilitate the use of sedation during the procedure. After the cataract is removed, the intraocular lens is implanted, completing the surgery. You can view the procedure on our site. The surgeon does a final check to make sure that the lens is in a good position. The wound is tested to ensure that it is watertight, and that the lid supporting speculum is removed. Immediately following the treatment, the patient is monitored in the postoperative holding area until they are ready for discharge. What is the cataract surgery procedure? 2. Second, a new lens implant is inserted into your eye. The cloudy lens is removed with a tiny instrument that enters your eye through a small incision—usually one-eighth of an inch or smaller—and gently breaks the cataract into tiny pieces that are then removed from the eye with a miniature vacuum cleaner. What happens after my cataracts are removed? Once the cataract is out, you will need a new lens in order to focus after surgery. Once your cataract is out and your implant is in, the operation is over. Artificial lens implants—made of plastic-like materials—are used to restore your ability to focus after surgery. These implants come in many different strengths, like glasses, and before your cataract operation, we will perform several measurements to determine the appropriate lens implant strength for your eye. What lens choices are offered? Doctor Frangie is pleased to be able to offer his patients a number of choices for their implants, in an attempt to decrease dependence on spectacles and/or contact lenses, depending upon the specific characteristics of your eye, and your own personal visual needs. It is important to understand that while Astigmatism-Correcting Surgery will improve your uncorrected distance vision (and in some cases your intermediate distance vision) you will still need reading glasses for tasks that are close – sewing, reading, model-building, etc. 3) MULTIFOCAL IOL IMPLANTS represent a major advancement in cataract vision correction. These lenses give recipients an enhanced “range” of vision so they have reduced dependency on contact lenses or glasses at almost all distances. While these technologies represent a definite improvement, it is important to realize that the implants will not give one’s eye the performance level of a normal twenty-year-old eye – the implants represent an improvement, not the fountain of youth! This new generation of implants typically allows patients to drive without correction, play golf without correction, use the computer without correction and reduce the need for reading glasses. Most people see better within a day or two after cataract surgery, but it is not abnormal or worrisome if your vision seems blurry for a few weeks after surgery as your eye heals. We will prescribe some eye drops for the healing period after surgery, and if you need new glasses after surgery, these will be prescribed for you once your eye is completely healed, usually about a month after surgery. What are the Post-Op complications? Can my cataracts come back? Cataracts cannot grow back, but sometimes a thin cloudy membrane grows behind the lens implant, making your vision blurry like the cataract did. This is not uncommon—it happens to roughly 10 percent of patients having cataract surgery. If it happens to you, a quick and simple laser treatment can be performed to re-establish clear vision.